Rules in China. Either they are followed to the letter or just completely ignored. As a foreigner how do you know which one’s which? 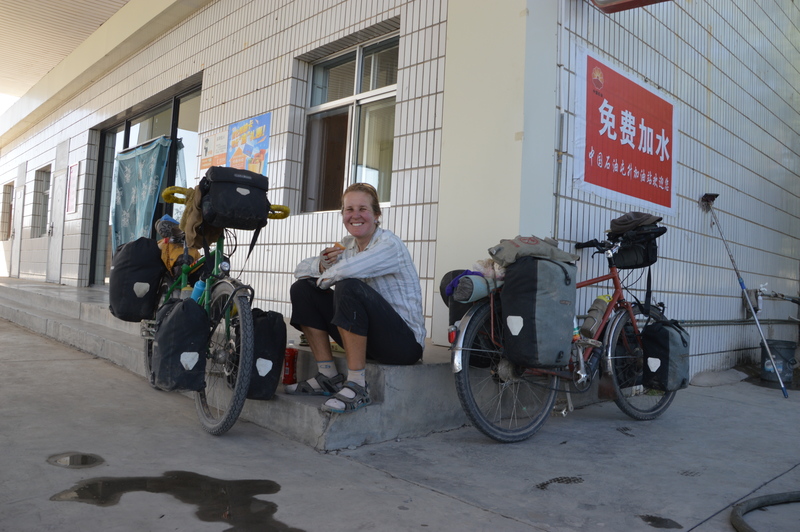 When we entered China we were under the impression that we could get two extensions on our initial visa, giving us 3 months to cycle through this amazing country. Then a fellow tourist directed us to the government website where it says you can extend only once. Yet we had heard of others obtaining a second extension recently but only in capital cities. But you must officially apply 7 days before your current visa runs out or else they wont grant you the full month. 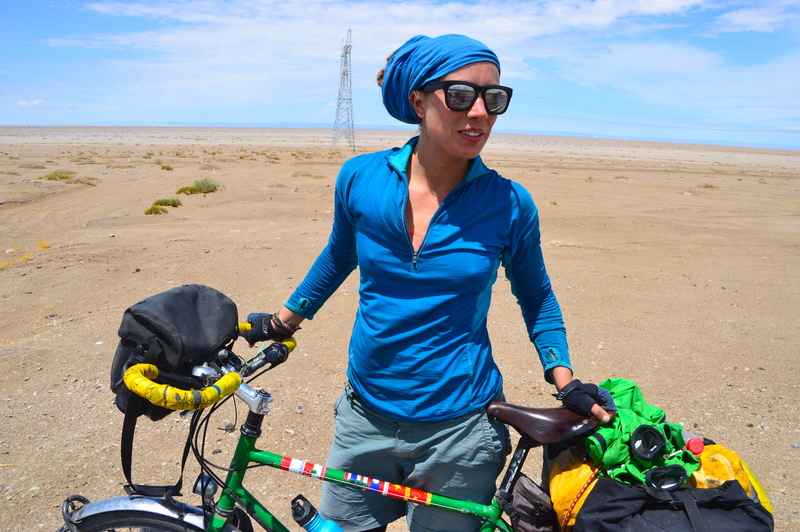 How to make head or tail of the information and continue to cycle towards Kazakhstan, squeezing in a visa extension somewhere and hoping not to have to leave the country in a weeks time? The map of this leg of the journey. Relatively simple is usually the best. (I’ve attached a map so you can see where I mean.) 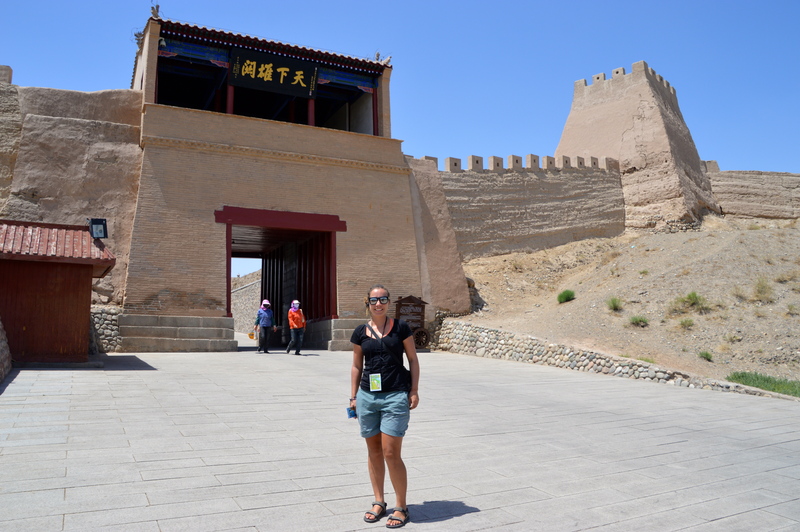 We were in Xiahe and Dunhuang, one of the major crossroads on the Silk Road, was our next major destination. 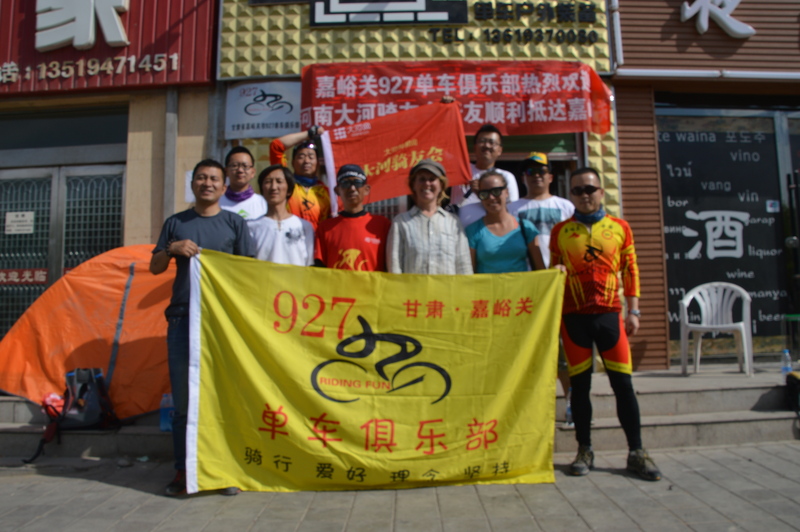 We had six days to cycle there, leaving us two days spare to travel back to Lanzhou to do the visa extension if required. This meant 1,350km to cover in a short amount of time. 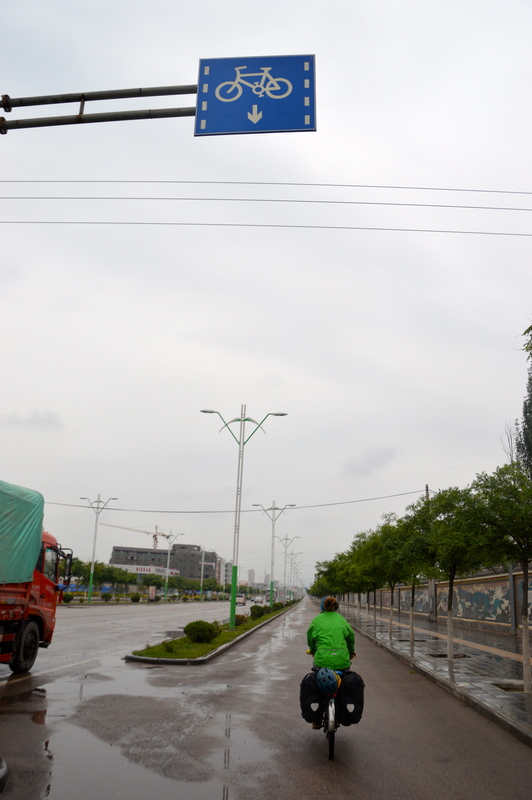 After much deliberation, to save time, we caught a bus to Lanzhou and then a train to Wuwei, which put us at the entry to the Hexi corridor and on to the Silk Road proper. 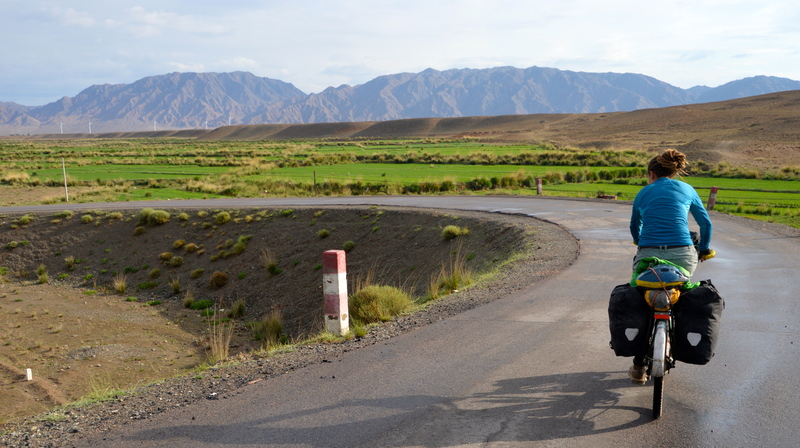 The trip was relatively uneventful, though we were hassled by the bus drivers because of the bikes (despite organising everything the day before), and the scenery changed dramatically from green highlands to red desert. 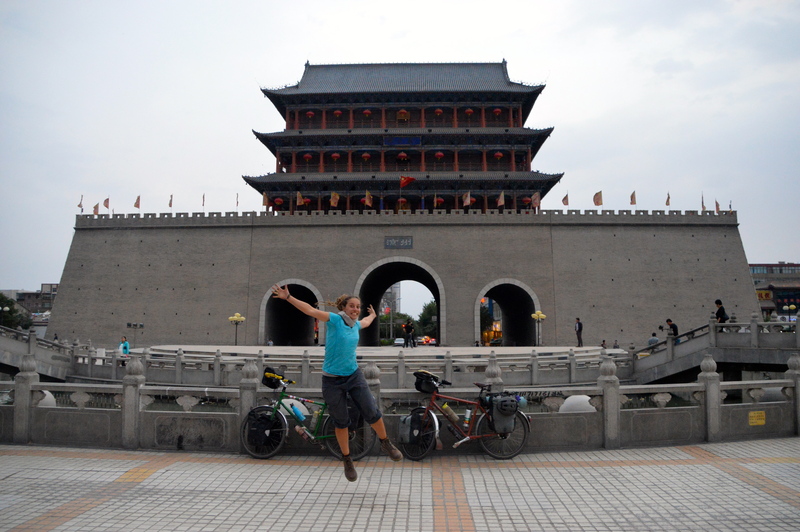 Jumping with joy at the South Gate Wuwei. 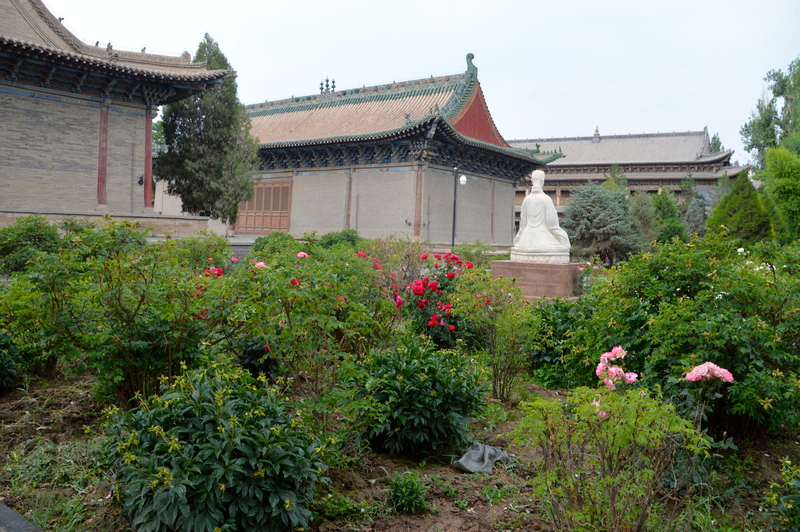 Arriving in Wuwei that night was exciting, as it was our first city on the ancient Silk Road. 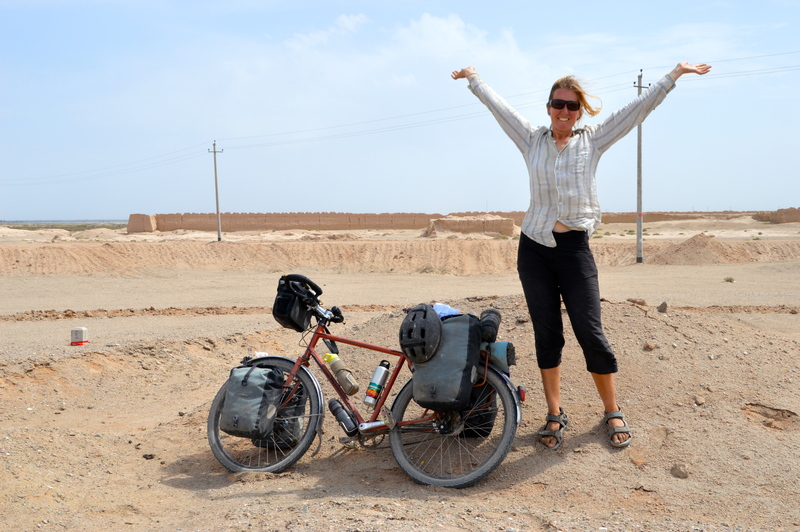 Jude and I have been dreaming of cycling along the Silk Road since the idea of this journey was first born. Like most cities along this road, the ancient temples, gates and alleyways are now hidden amongst the shiny generic buildings of ‘New China’. 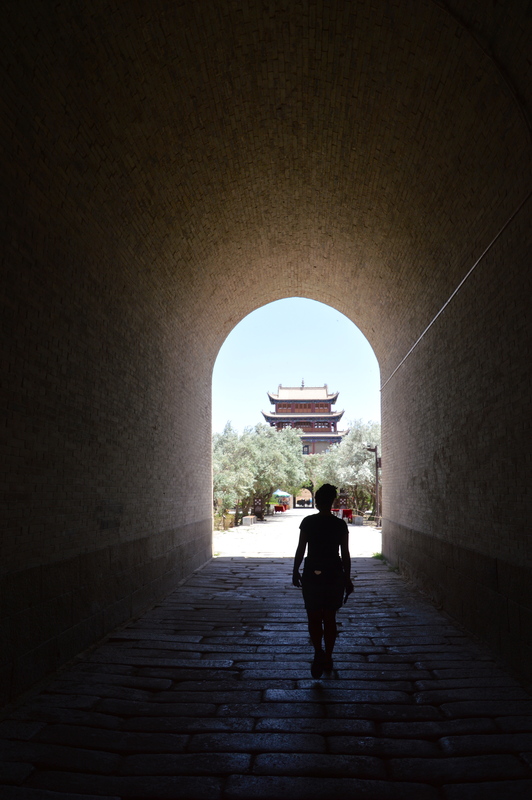 Our hotel room for the night overlooked the South Gate of the city and as we drifted off to sleep, images of following the path that people, goods and ideas journeyed along between China, Europe and India over a millennia ago floated through our minds. Jude was gifted an umbrella, a sign of the rain to come. A dedicated bike lane, well sort of. 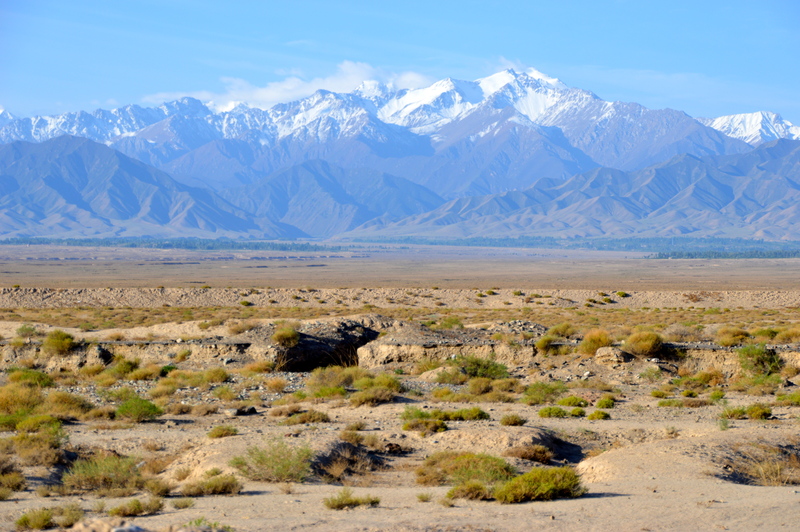 Despite having a large distance to cover in a relatively short amount of time, we agreed that we didn’t want to miss out on the major sights of the Silk Road. 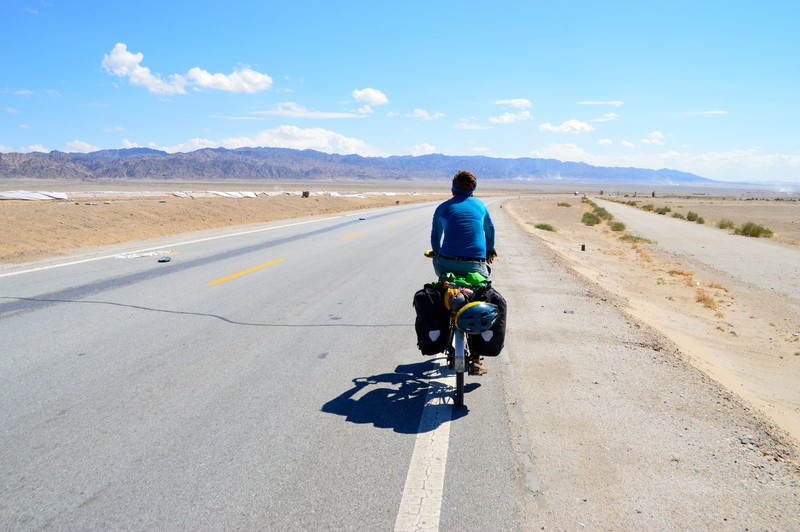 A balance would have to be reached between cycling hard and sightseeing. Waking early the following morning, we explored a few temples before hitting the road heading west. 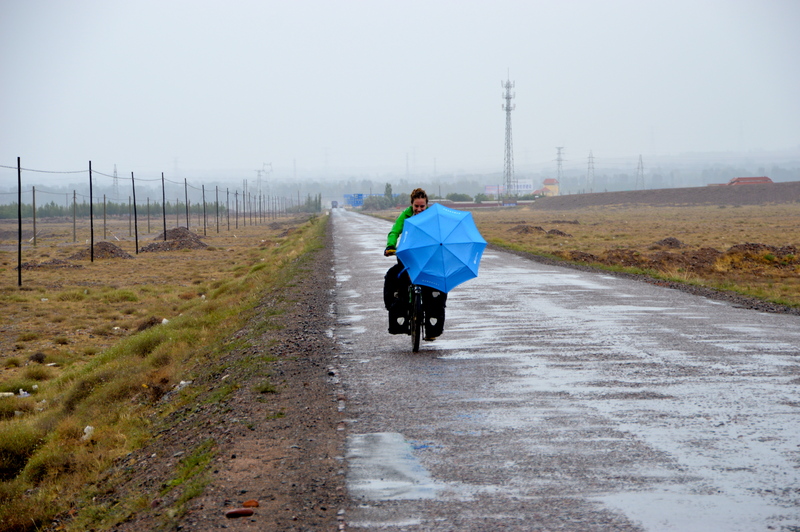 Cycling out of town a slow drizzle began and by lunchtime our dreams of the ancient road had melted with the rain as we passed through industrial areas and flat uninspiring scenery. By nightfall we doubted that we were in the desert during summer, as the rain had not abated all day. Abandoned housing provided the perfect shelter for the night, and we bunked down for an evening of indoor camping. Camping in an abandoned building. 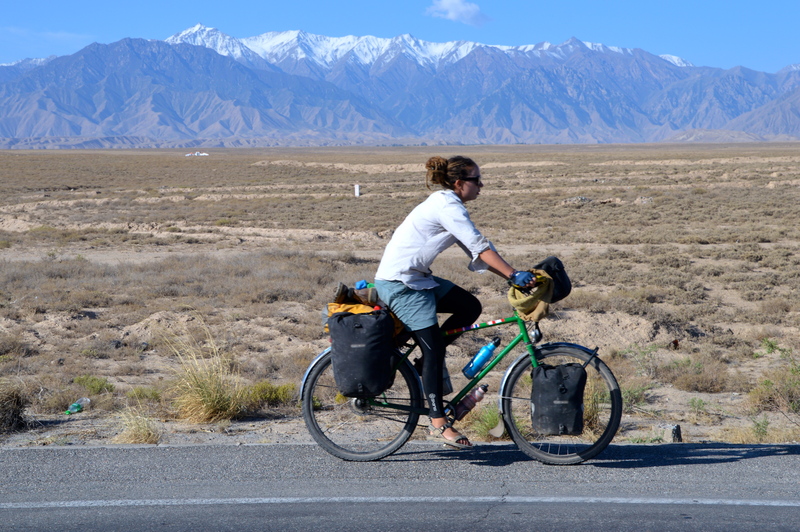 Re-inspired to be on the Silk Road. 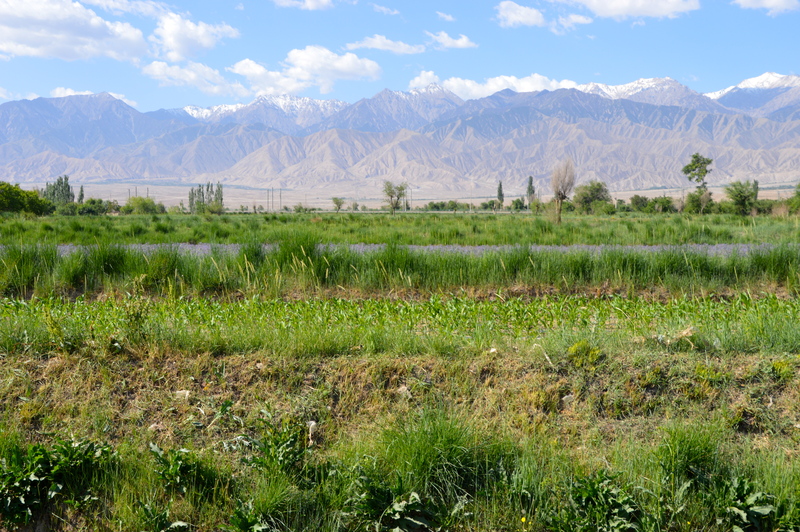 We came across an occasional green oasis. We squealed with joy when we saw our first snow capped peaks. Fresh and dry we woke the next morning re-inspired by the idea of the Silk Road. With smiles on our faces we set off early and squealed with joy when we saw our first snow capped peaks in the distance. After about 20km a couple on a tractor drove passed, and they waited for us 2kms further on to offer us a ride with them. 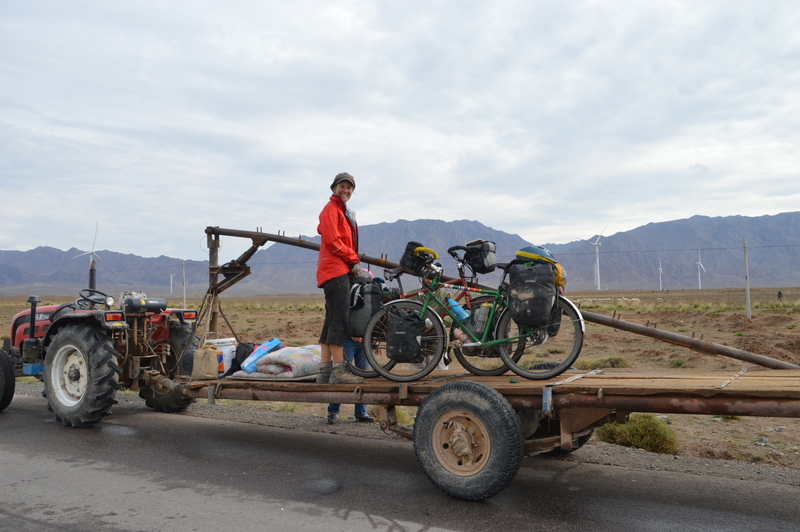 We accepted their offer, as the idea of riding on the back of a tractor was novel and we thought they were only going 10kms up the road. So we bumped our way along, retying the green fairy to the trailer five times as she kept falling over. 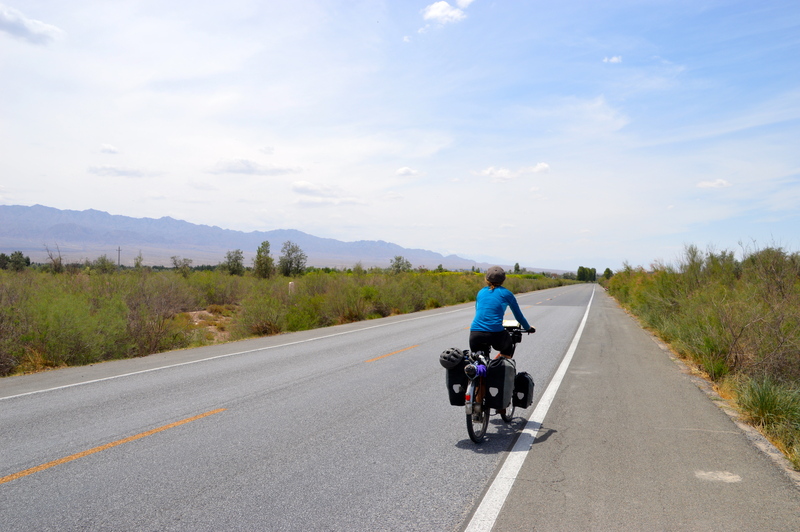 The kilometres slowly passed by – 10, then 20, then 30, then 100. 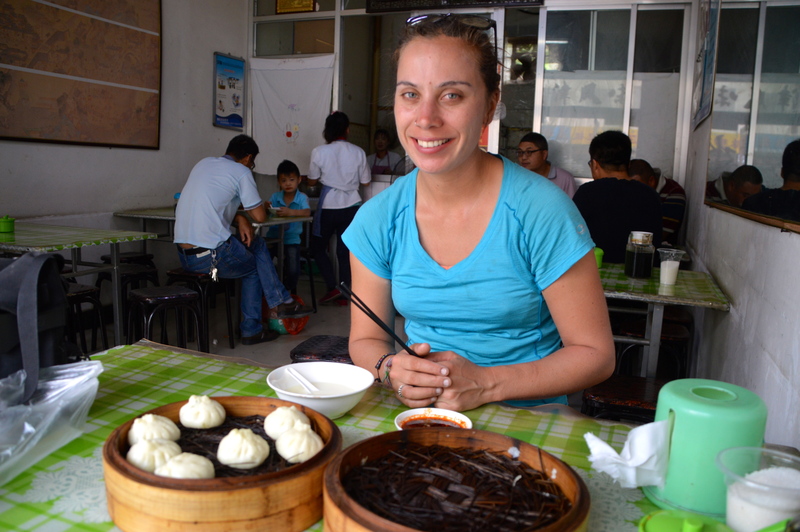 We stopped for lunch and our hosts enjoyed the notoriety that bringing two foreigners into the restaurant afforded them. As we couldn’t speak Chinese all questions were directed to them and I’m sure some fantastical stories were shared. Putting the bikes on the back of the tractor. Retying the green fairy as it kept falling over. The mandatory goodbye photo shoot. 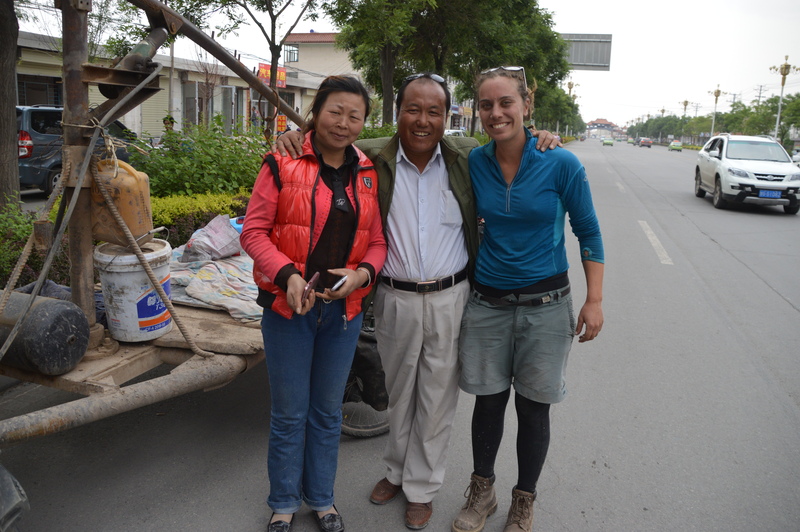 The lovely couple waved us goodbye in Zhangye, after the mandatory photo shoot was completed. All in all we had bumped along for 120kms, mostly on dirt roads, going a little faster than we would have gone if riding the bikes. 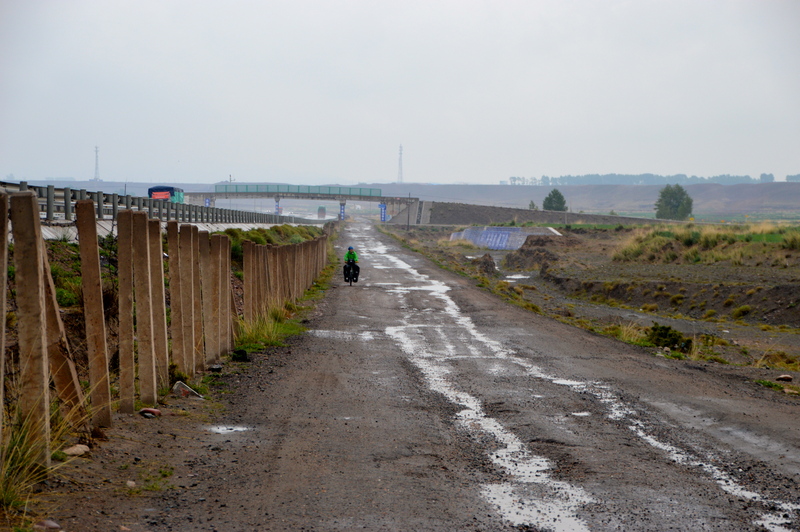 While I was not admiring the amazing scenery I was again wondering about the logic of ‘New China’. 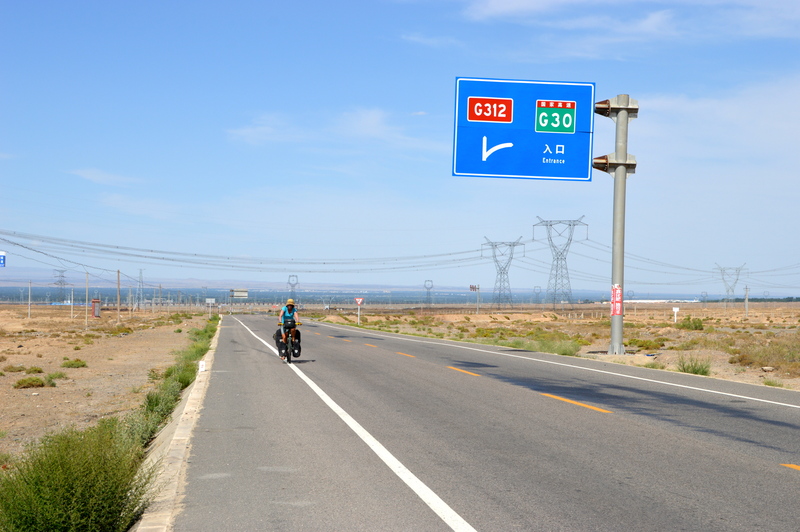 The G30 motorway runs beside the decaying S312 on which we had travelled, but tractors, motorbikes and bicycles are not allowed on it. When the S312 finally gives up the ghost, I wondered how the locals are meant to travel between towns using the only transport they can afford. This building is over 1000 years old. 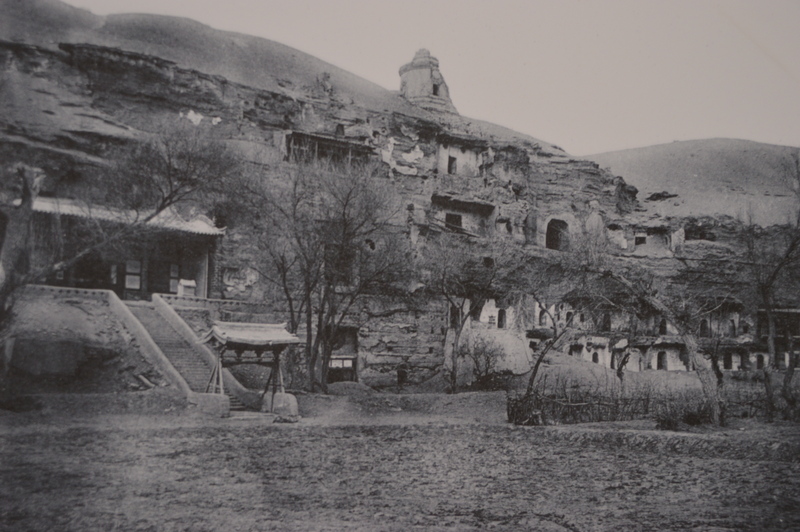 Dafo Si in Zhangye houses a spectacular wooden reclining Buddha in a temple that dates back to the Western Xia dynasty (1098 A.D.). 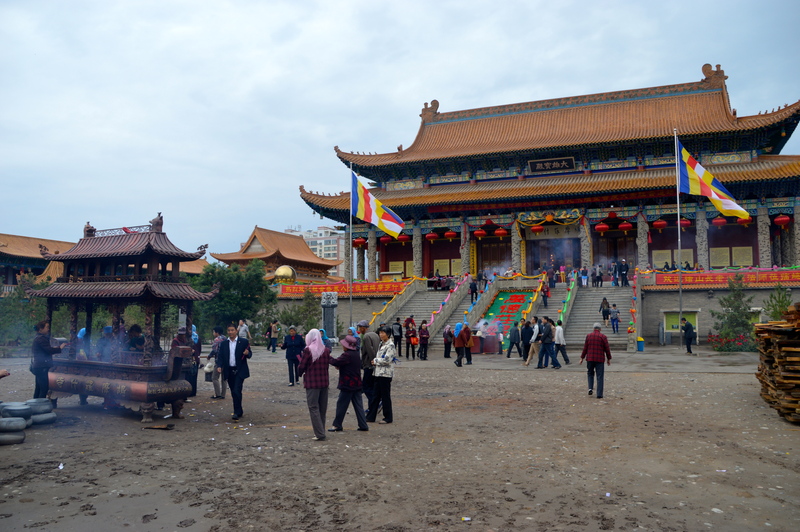 It was phenomenal to see an original structure and Buddha dating back to ancient times, as almost all of these were destroyed during the Cultural Revolution. 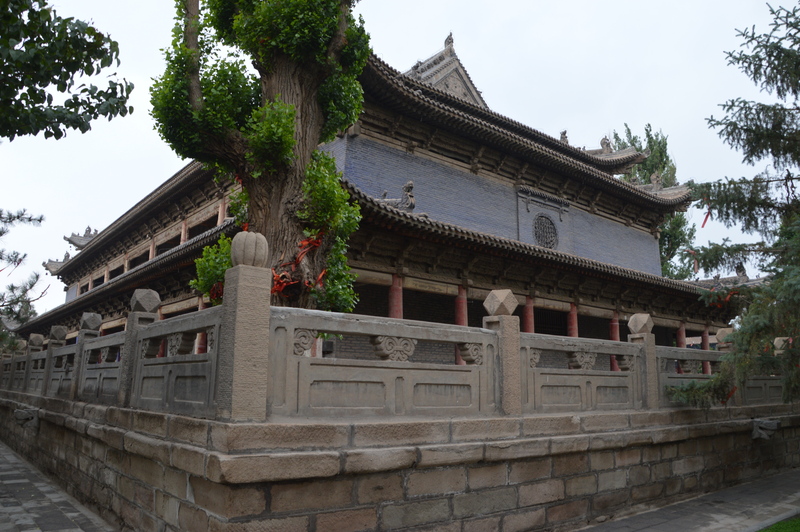 Many of the ‘old’ structures you see in China today are either renovated, or completely rebuilt replicas. While wandering around the complex the rain started again and we overheard a tour guide telling their group that it is a sign of good fortune if it rains while you are there. It probably is for the locals, but we were beginning to wonder if the daily rain would be a feature of our mid-summer desert crossing. 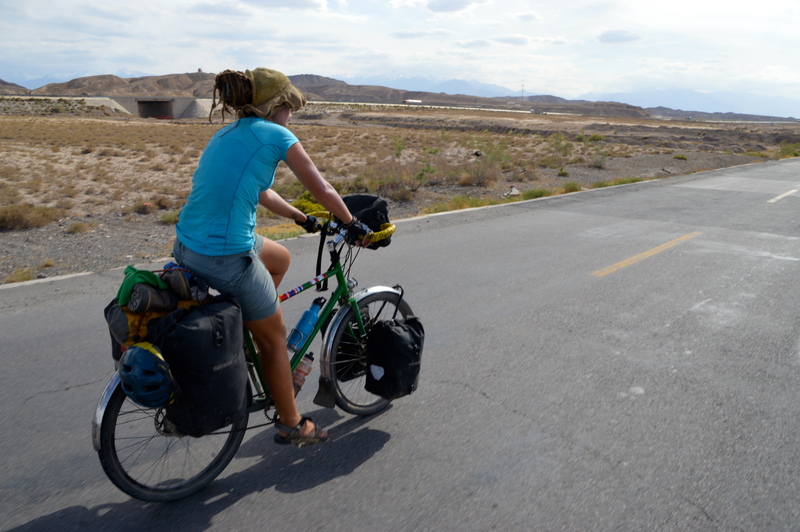 Not so fortunate as a cycle tourist. Excited to meet some French cycle tourists. 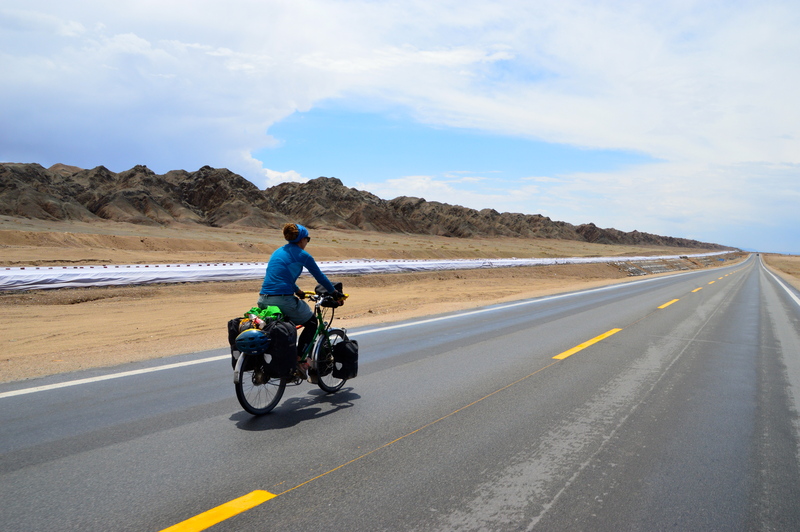 On the road out of Zhangye. Following the S312 next to the G30. Fortune was also not smiling on us when we attempted to find some accommodation. 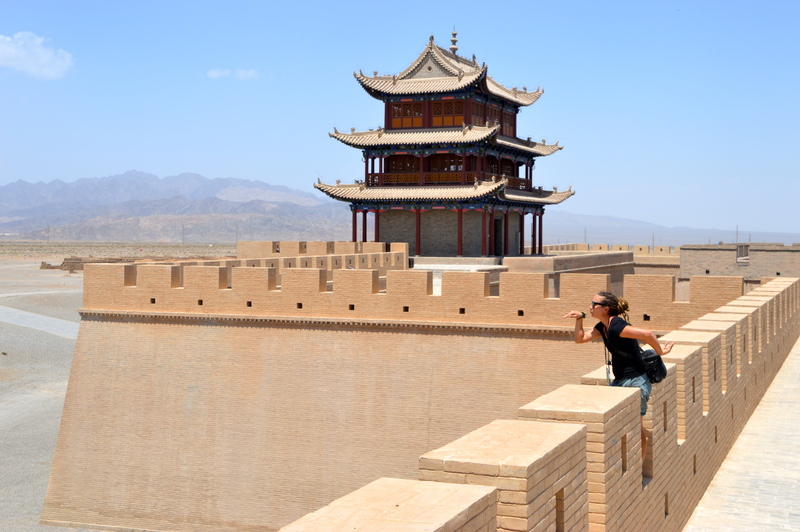 As we were to experience many times during our stay in Gansu and Xinjiang provinces, being a foreigner is a hindrance when looking for accommodation. 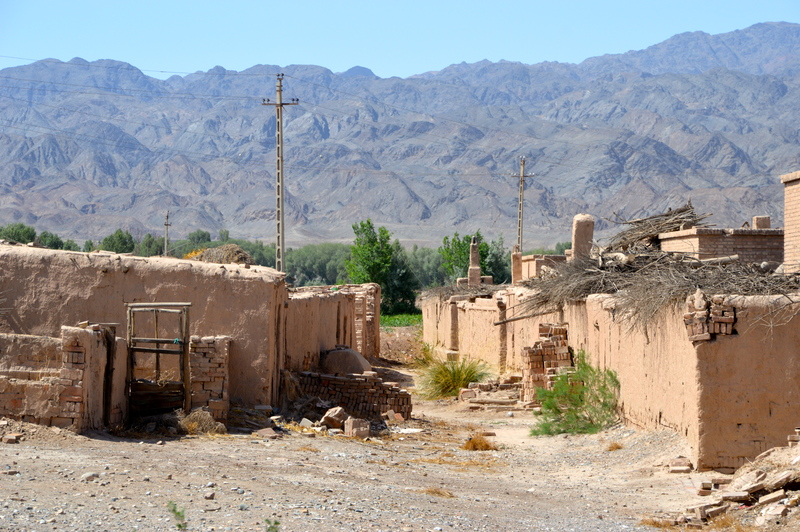 In large towns we would spend 2-3 hours looking for a hotel that would accept foreigners, if they did the price was usually way over our budget, and despite being the 2014 edition of the Lonely Planet, most of the recommended hotels were either being renovated or no longer accepted foreigners. After our seventh rejection we were getting frustrated and soaked, and were about to cycle out of town to camp when I happened upon a rather plush hotel that would accept us. We did blow the budget and but we made the most of it. Hot days into a headwind. Excited to find water after making the rookie mistake of not carrying enough in the desert. A whole lot of nothing. 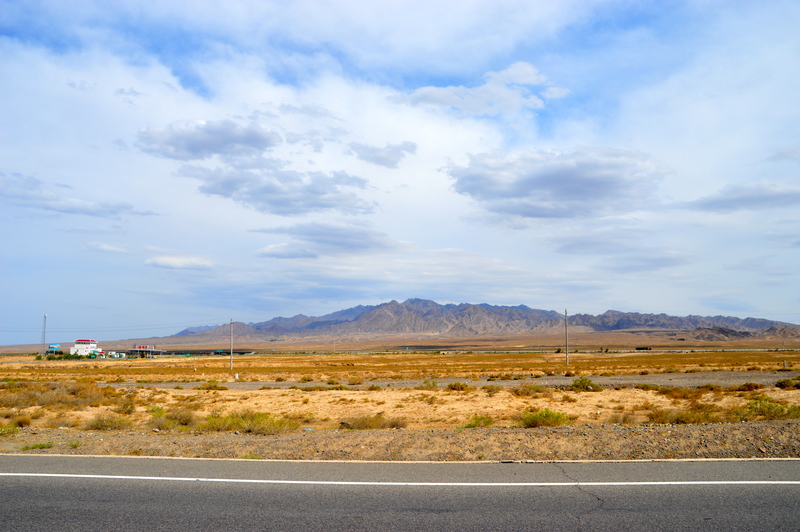 Service stations provide the opportunity for water and snacks in the desert landscape. 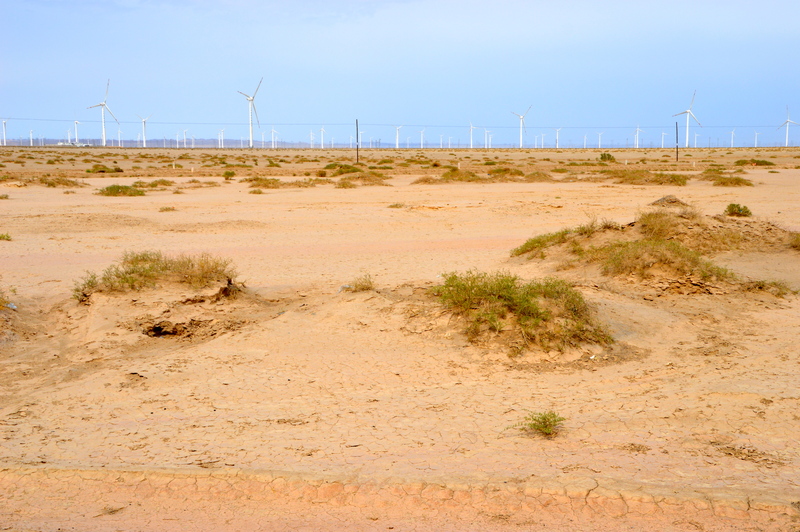 Gansu district is China’s renewable energy homeland, having loads of sun and constant strong winds. Strong winds can either be a blessing or a pain in the arse, and for the next three days it was the later. 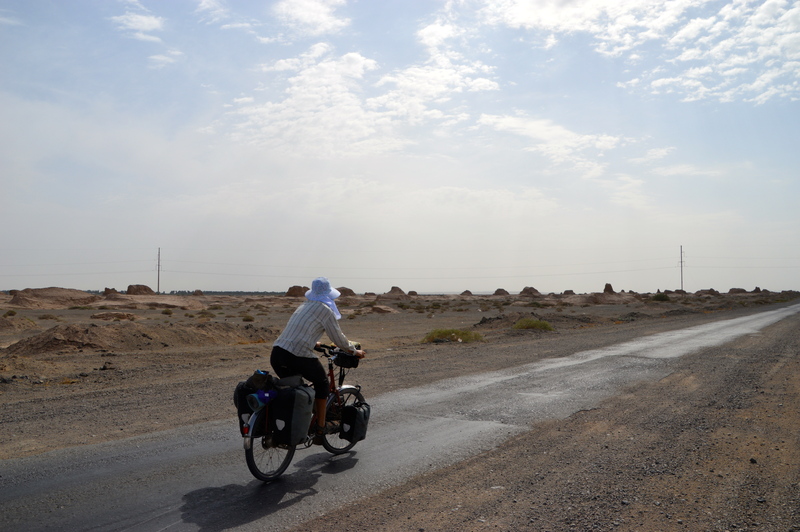 While cycling through the open desolate landscape we battled a constant headwind, receiving reprieve only at the small poplar tree lined oasis towns that we occasionally cycled through. 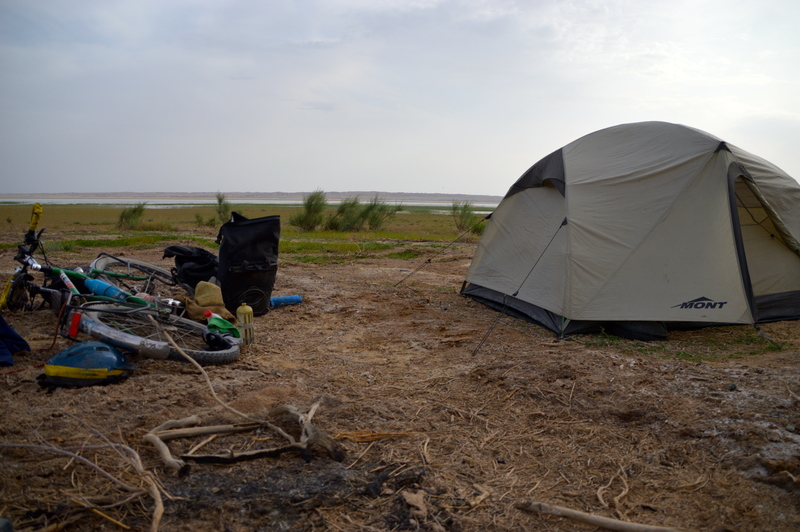 The going was tough, but our campsite for the night more than made up for it. 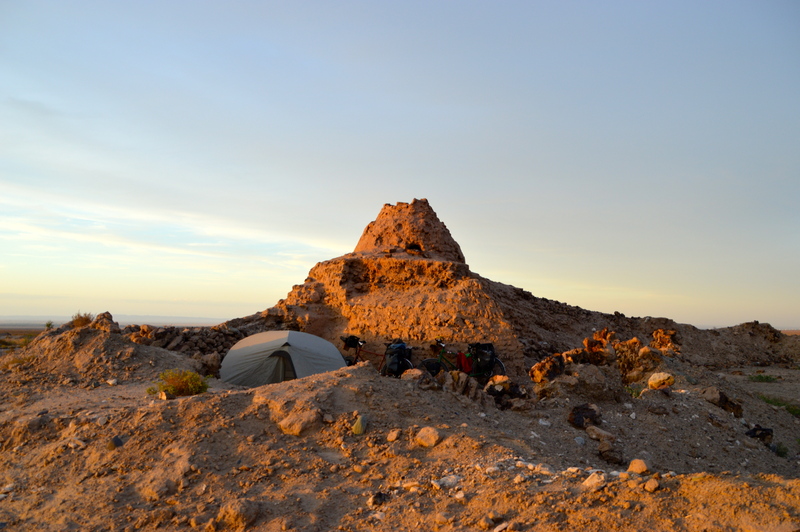 Ruins from days of old were scattered along the side of the road and they provided the perfect shelter for our tent. Cup of tea in hand we watched the sunset colour the sky and the snow capped mountains that dominated the skyline to our south. 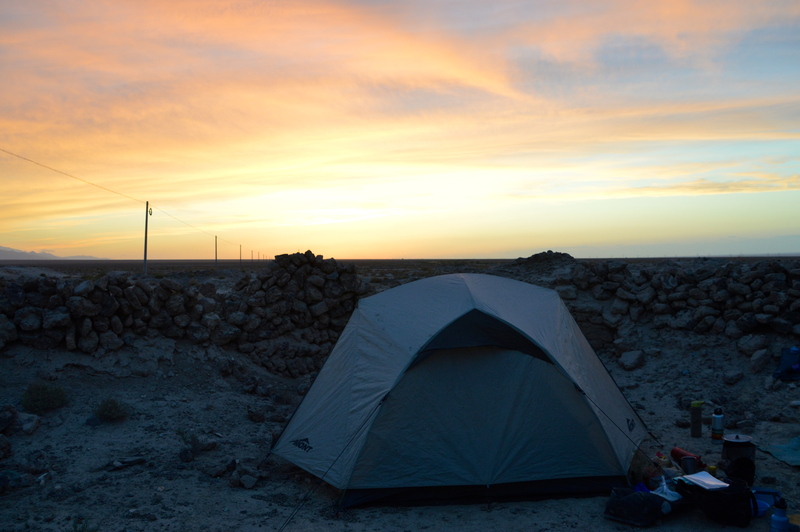 Our camp sheltered by the ruins. The view out of tent in the morning. 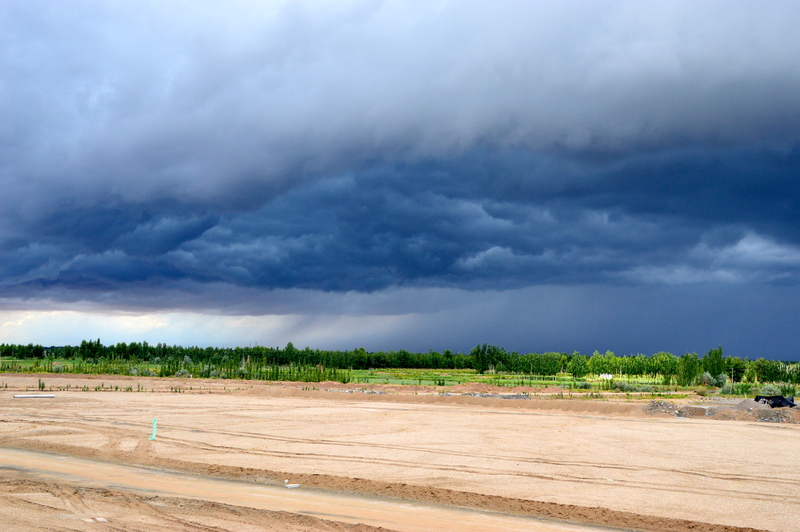 The weather remained volatile the next day with morning heat, afternoon windstorms followed by cold rainy weather. 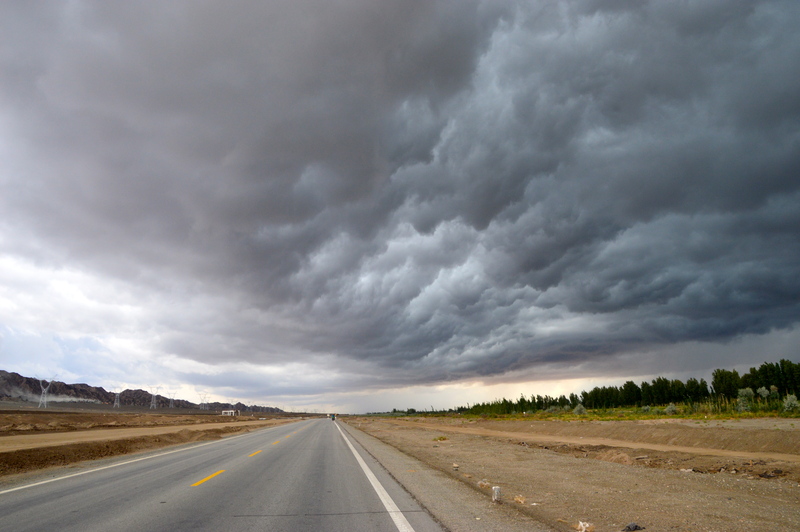 Along the freeway between Jiuquan and Jiangyuan we were battling a ripping crosswind with side wards rain, when a 4WD pulled out of a service station that we were passing and ran straight into me. As usual in China the driver had pulled out on to the road without looking for traffic. As I hurled a barrage of abuse at her, she stood there smiling and nodding like the idiot she was. Being hit by a car ratio – Astrid 2: Jude 1. Battered and bruised we continued on and were accosted by a group of Chinese cyclists. They led us to their bicycle shop where we posed for the mandatory photo shoot and then we played the ‘find a hotel that will accept foreigners’ game. 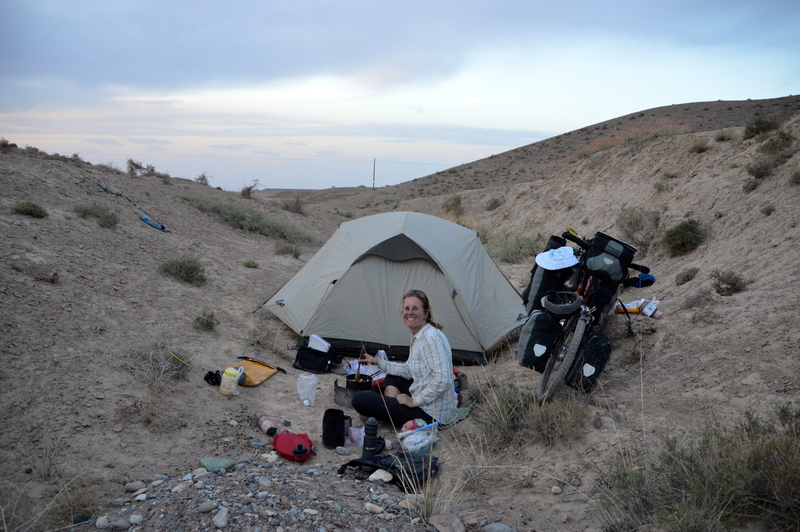 It took 3 hours and we vowed to camp for the rest of the trip unless we knew of a backpackers in the town we were passing through. Riding out in the morning. Another oasis town with a stunning view. Mandatory photo shoot with the Chinese cyclists. 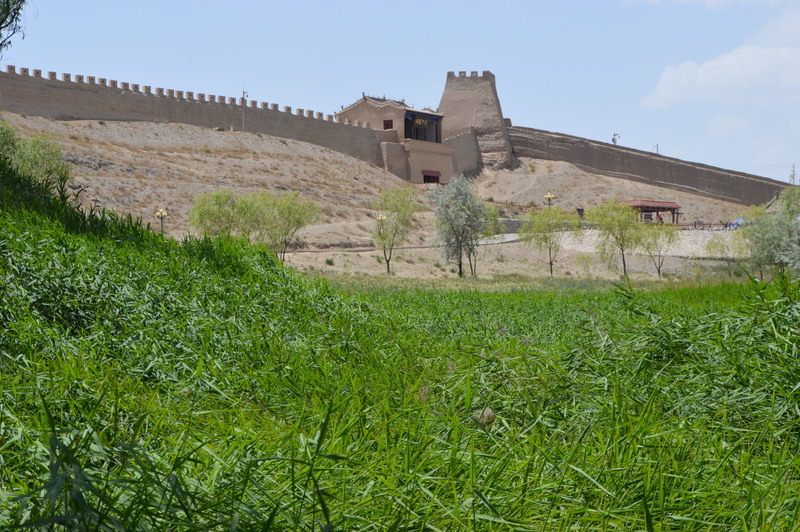 During the Han dynasty when the Silk Road was at its peak, Jiangyuan was the gateway between China and the badlands to the west. 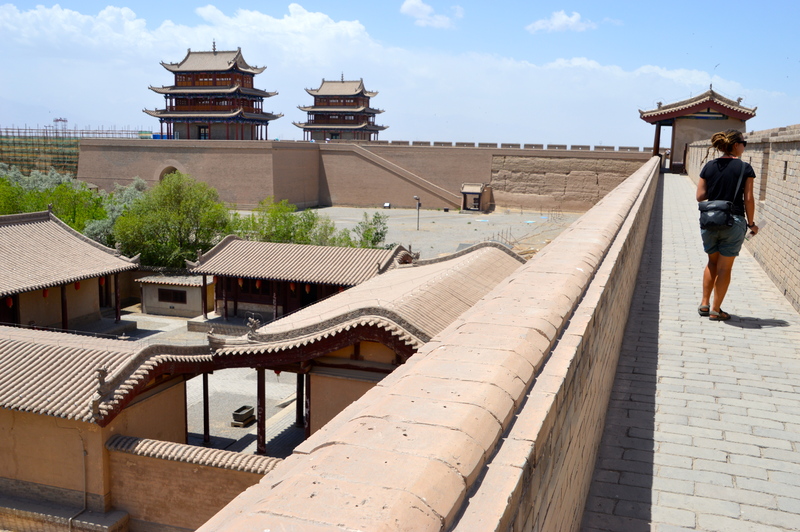 A fort was built and the great wall was extended to keep the barbarians at bay. 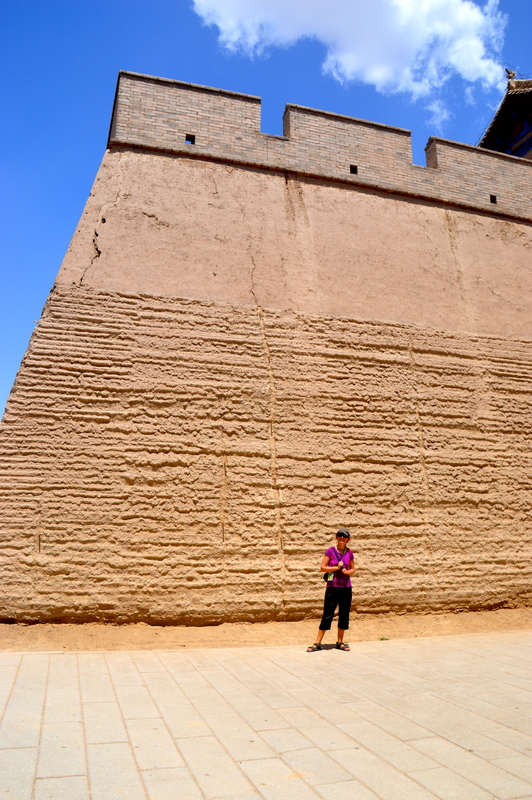 Sections of these structures remain, but as with all things ancient in China they were getting a thorough facelift. The fort was nice to see, but not worth the extortionate entry fee (in my opinion). 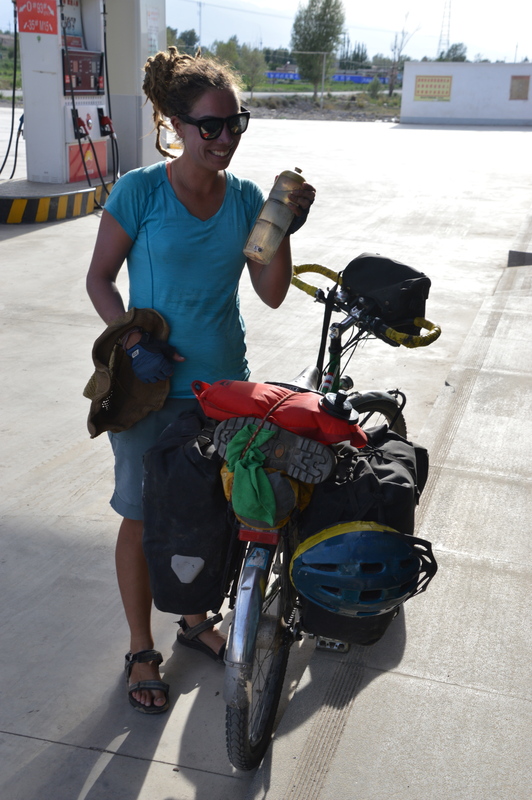 With the continuing headwind we only managed 40km that afternoon. Setting up camp that night we discussed how amazing a tailwind the following day would be and we put a request out into the universe. Would it work? The dirty salmon would have fit right in during the Han dynasty. East gate to the fort. Bok bok loves the fort. You can see where the reconstruction has occurred. Rising in the morning we put our heads out of the tent and checked the wind. During the night it had changed direction and we were ecstatic. 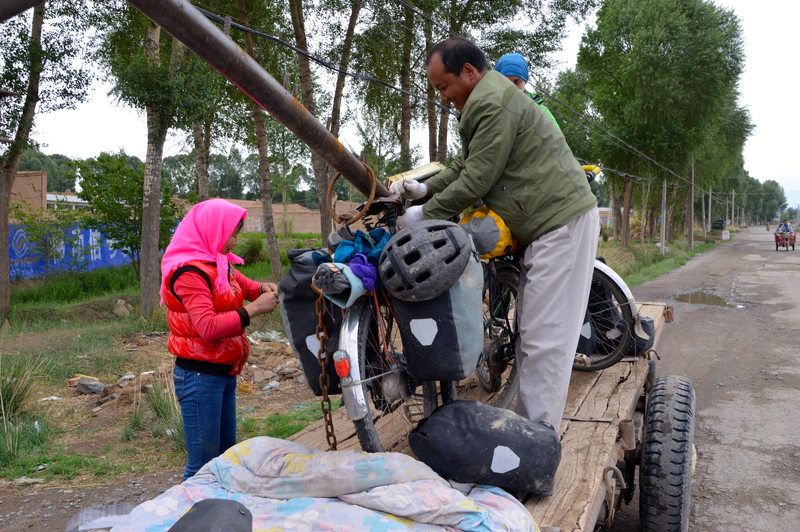 We packed up quickly and hit the road, covering kilometres in half the time. By mid morning it had swung again, but we held on to hope as the road was changing direction soon, providing us with a tail wind again. In the distance we could see hundreds of giant wind turbines, and I was reminded of the current Australian governments idiocy when it comes to renewable energy. That afternoon we flew. 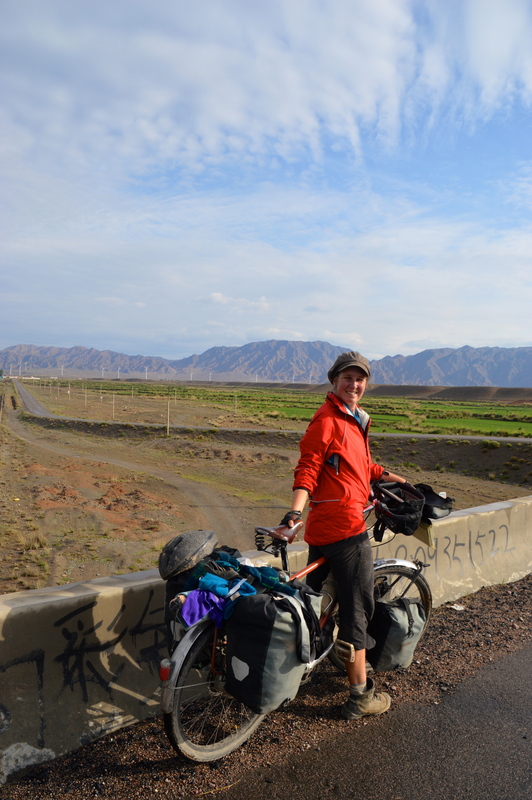 Passed wind farms, passed Silk Road ruins, passed bizarre land formations, finally stopping on the side of a giant lake. A beautiful campsite should always be taken. Small villages dot the road. 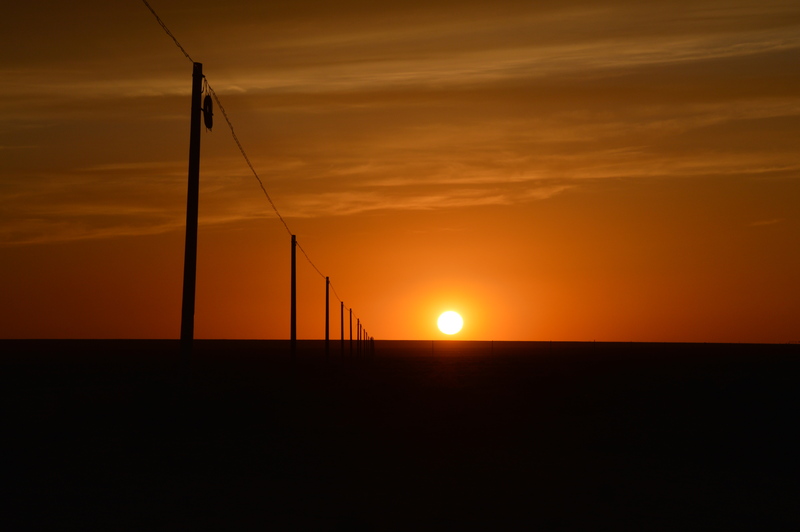 This night we requested a change in the wind direction – would it happen? Houses provide good shelter from the wind. 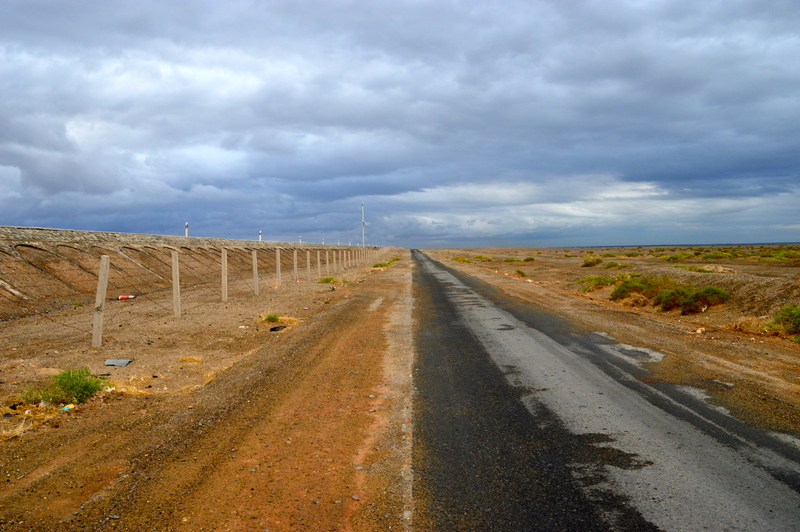 Wind farms in the desertt. Hundreds of wind turbines on the horizon. 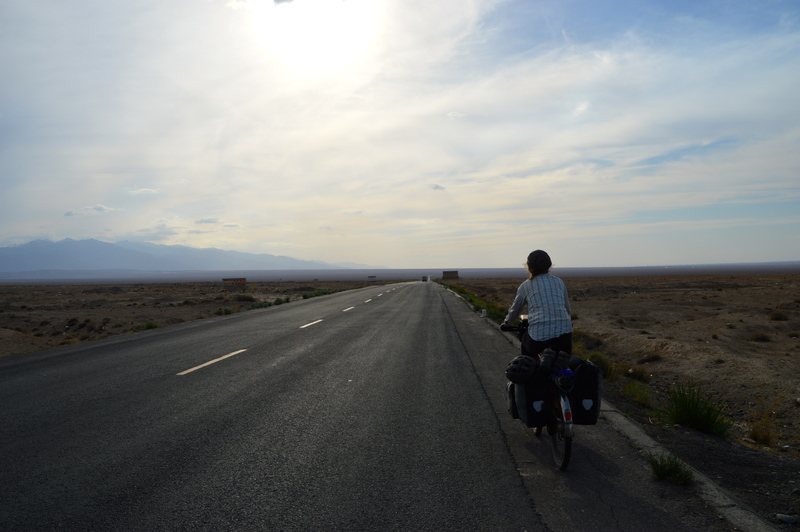 We had covered 165km that day and we had 160km to go until Dunhuang. The challenge was set. 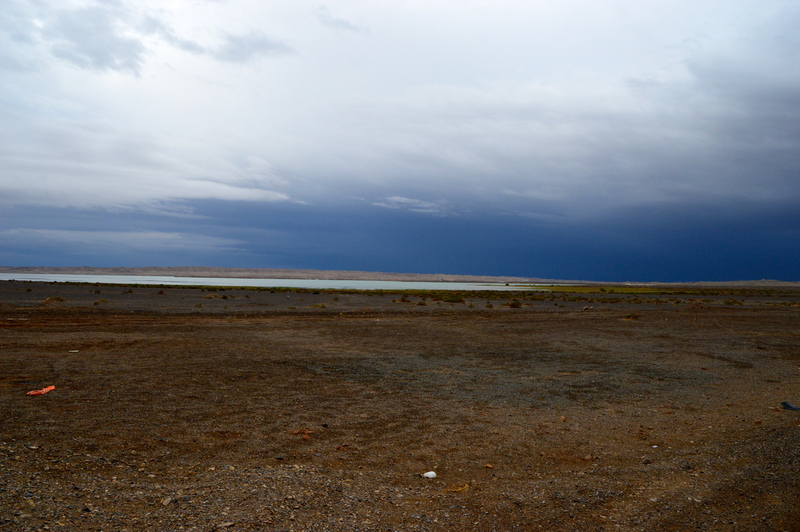 In the morning we could see a multitude of storms on the horizon. Our day was spent trying to outride them for as long as possible and when they hit we bunkered down in tunnels, drinking cups of tea and reading books. 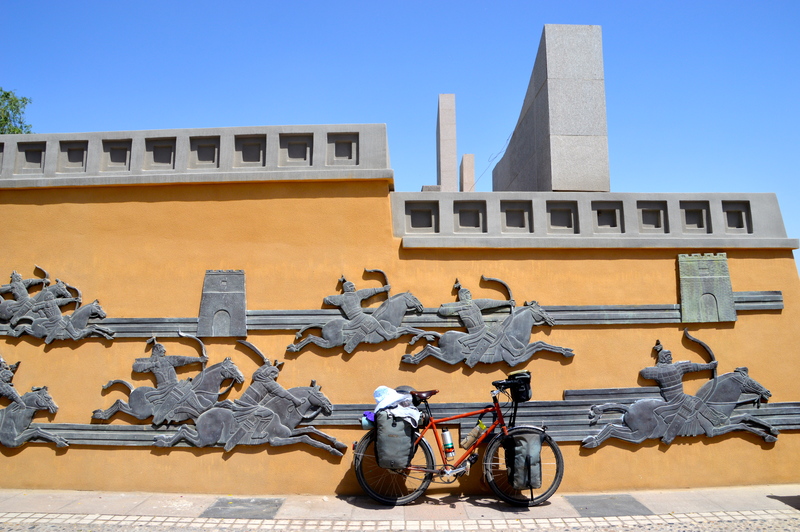 Despite storm induced delays we arrived in Dunhuang by the early afternoon. 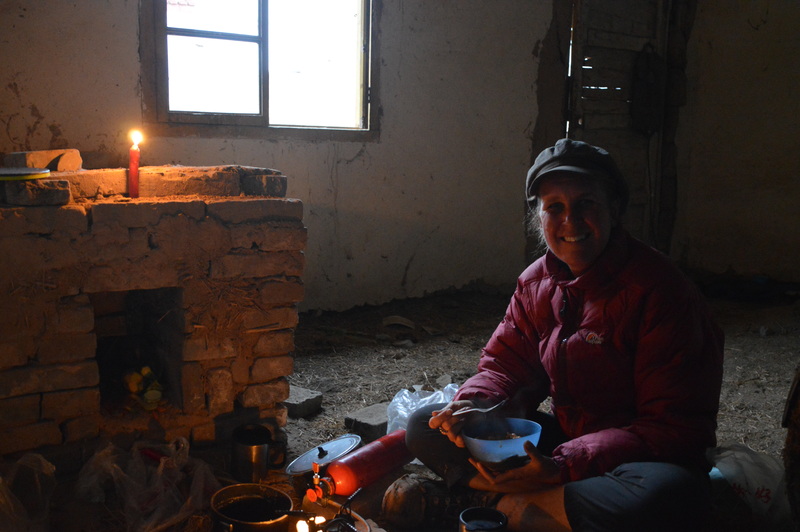 We celebrated with food and beer before attempting the frustrating search for accommodation – the place we had planned to stay no longer existed. 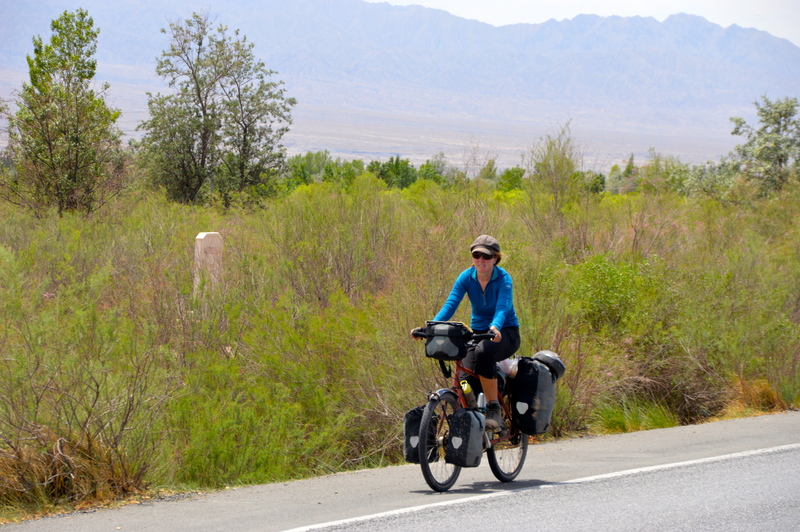 During our search we located the large group of cyclists that we had heard about a few days earlier from cyclists going in the opposite direction. It was great to chat with them about their adventures and before we knew it the sun was setting and we still had nowhere to stay. Taking full advantage of the tailwind. Camping on the lake was beautiful. Storm on the horizon 1. Storm on the horizon 2. Storm on the horizon 3. Storm on the horizon 4. 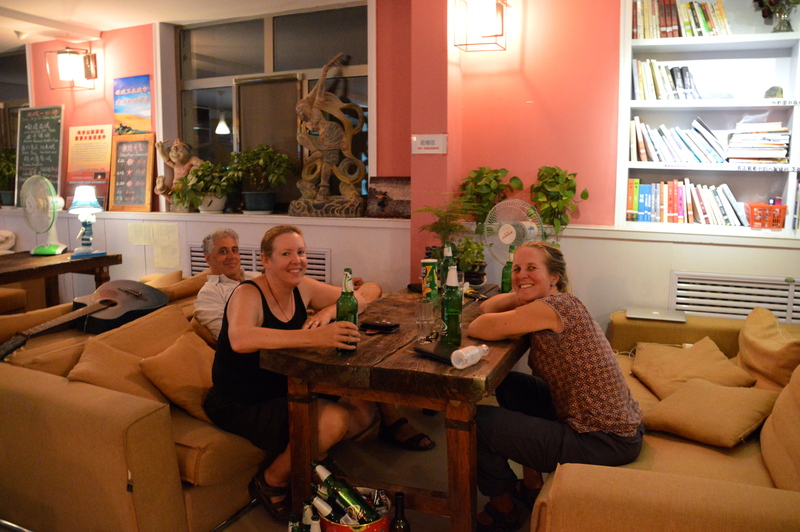 At 10pm we checked into Sha Zhouyi International Youth hostel, the place that became our home for the next six days. It was time to relax, well sort of. There was still that little visa issue that we needed to take care of. So which rules apply? Seems like you can get a second visa extension in our experience at this time. 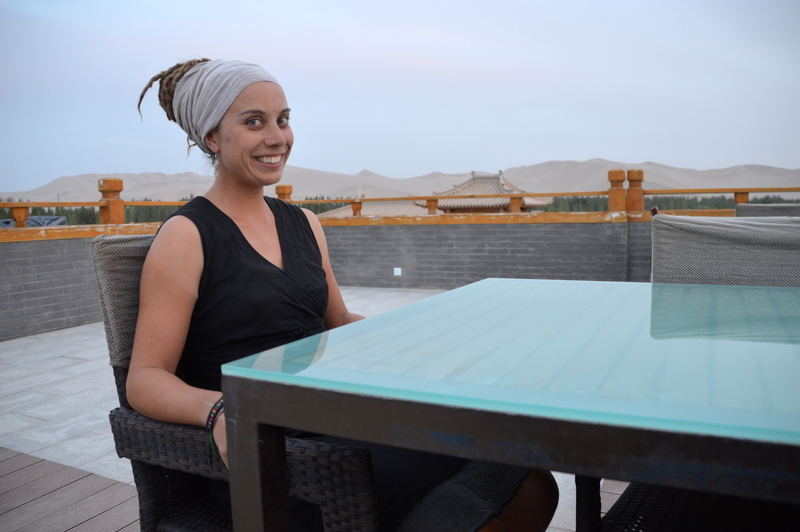 We arrived seven days before our visa expired as required by the government, to be told that in Dunhuang they only accept extension requests the day before the visa expires. After being provided every excuse under the sun as to why they could not help us we made a last-ditch effort and typed into Google translate “is there any way that you can help us please?”. Well it worked. We were sent off to the photography studio, had the forms issued and were asked to return in 3 days time to lodge the paperwork. Score!!!! They skies cleared and we were happy. 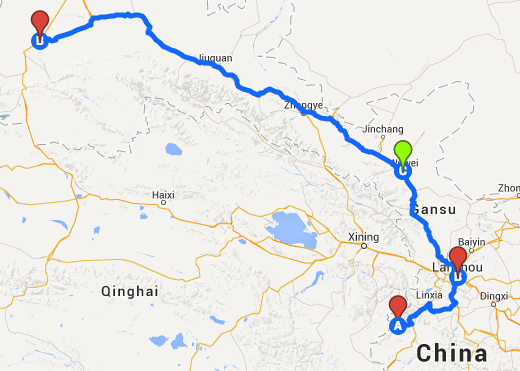 Covering the last 160kms to Dunhuang. 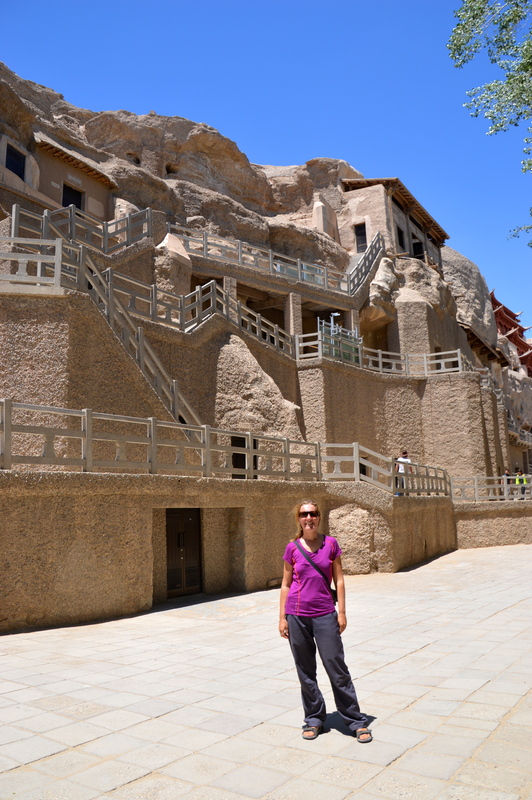 The main reason for our detour to Dunhuang was to visit the Magao Grottoes. 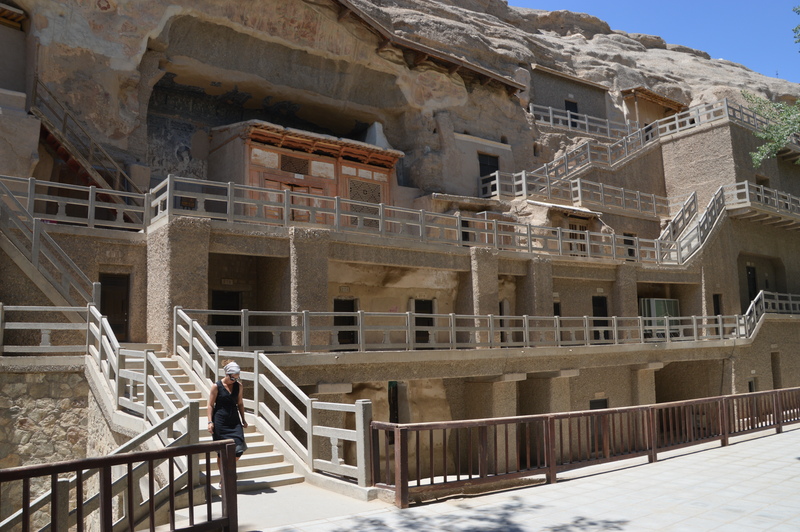 25kms southeast of Dunhuang, there are 735 caves carved into a 1.6km stretch of cliff face. 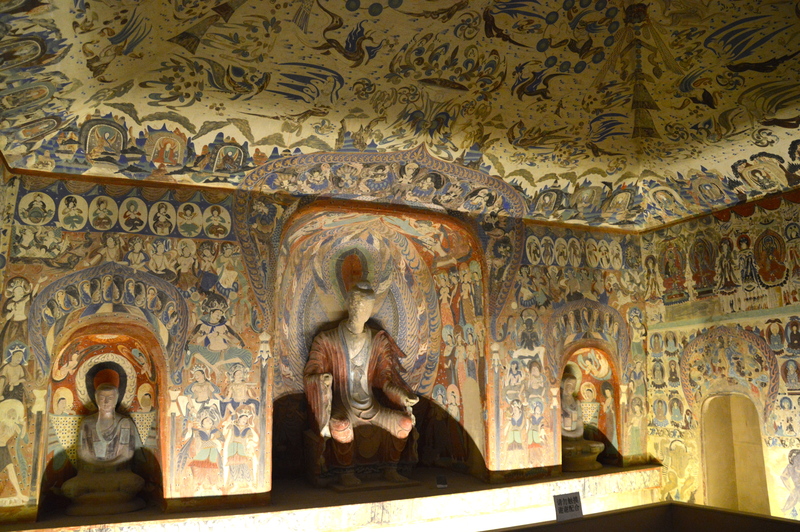 The frescoes on the walls cover a thousand years of Buddhist paintings, the change in styles and content was fascinating. 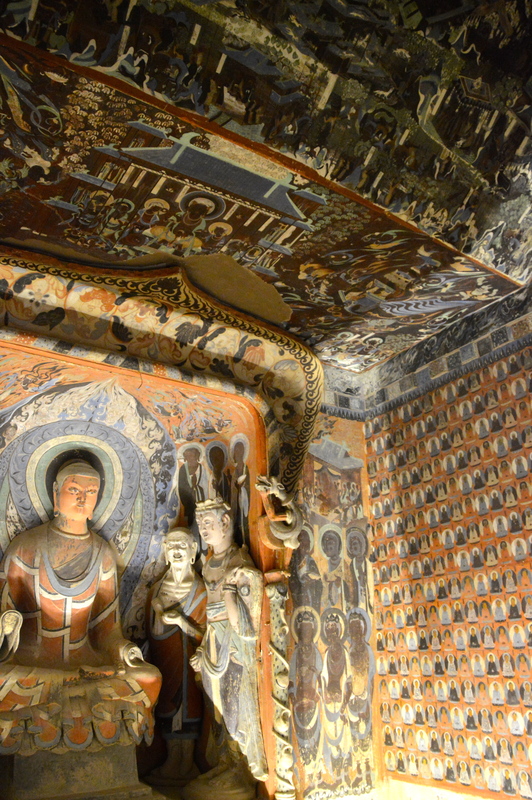 There were over a thousand Buddha images in each cave, and the colours and details are still vivid. The caves must be visited with a tour guide, and luckily we were the only English speakers there at the time, so we had our guide Michael all to ourselves. He told endless stories and filled our head with the history of this magical place. We did get to see the famed ‘library cave’ where 50,000 Buddhist manuscripts had been discovered and due to the instability of the time “sold off” for a pittance to opportunistic explorers from Europe. The whole experience was incredible. Jude and our guide Michael. 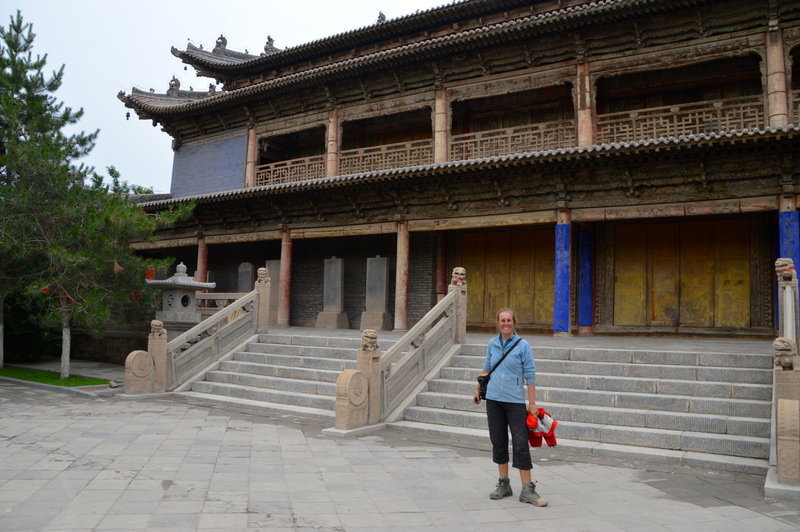 In front of the Mogao Grottoes. The view from the outside. A replica of the caves. 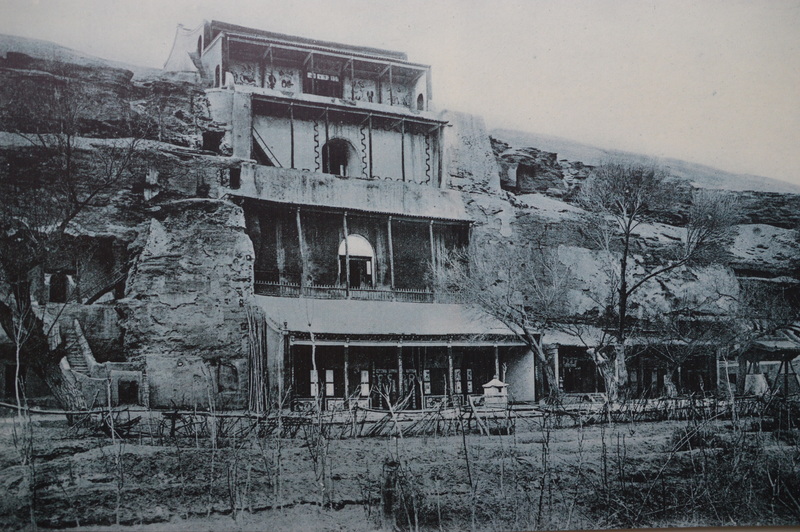 What the caves looked like a hundred years ago. 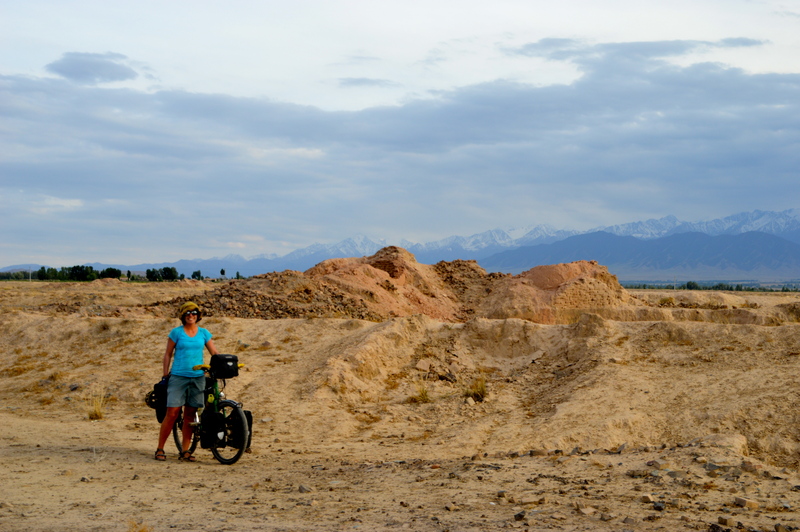 The remainder of our time in Dunhuang was spent drinking cups of tea, organising our visa extension, tinkering with the bikes, preparing for the next leg of the journey, catching up with family and friends via Skype, and exploring the culinary delights of the city with fellow Aussies Jill and Richard. The local burger with as side of tempura mushrooms and a cold beer was an afternoon favourite. 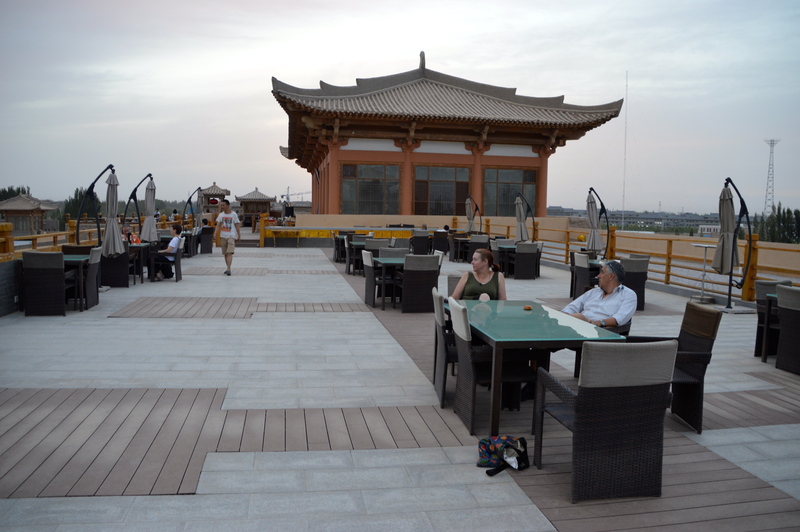 Sunset dinner on the roof of a fancy hotel. Dinner overlooking the sand dunes. 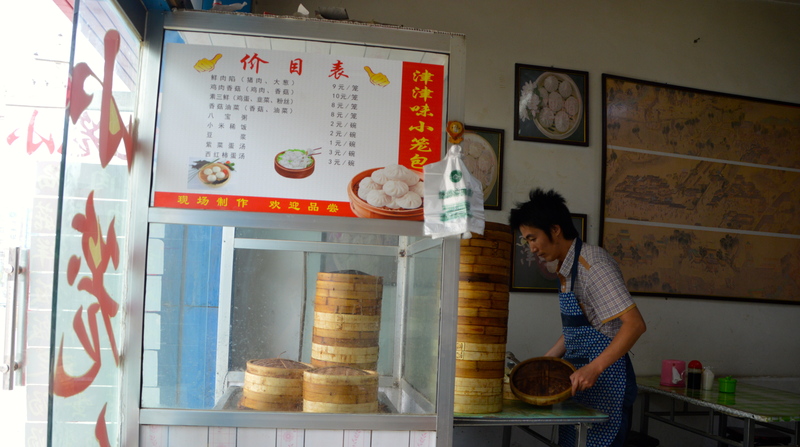 Our daily steam bun shop. Sharing a beer (or 5) with Jill and Richard. Talking of cold beer, it’s time to go an enjoy one.